With Industrialization and globalization at their helm, the demand for metal and metal based machines, equipments and other products are witnessing a global upsurge. 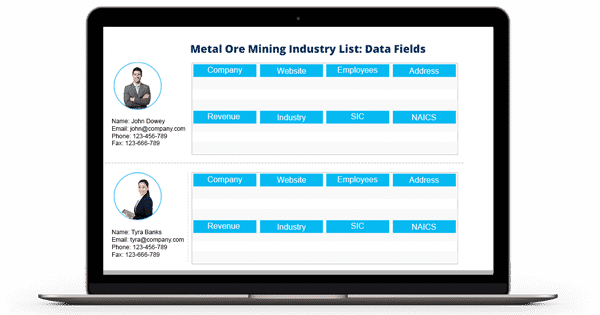 If you are looking to explore opportunities in the Metal and Mining Industry and need a marketing database, Blue Mail Media can help you meet the purpose. Our Metal Ore Mining Mailing List has been designed to help you connect with key stakeholders in the industry and expand your scope endlessly. Blue Mail Media has been a well known when it comes to data marketing solutions providers in the US as well as other important regions. Having strong data partners across the US, UK, Canada, Australia, China, Africa, Russia, India and other world markets, we can go an extra mile to help you with qualitative data that helps you achieve an increased response rate, conversion and ROI. Our Metal Ore Mining Industry Email Database has been created to help you execute your multi-channel marketing campaigns in a flawless manner giving you enough options to connect with your target market. Whether you wish to connect with your prospects via telephone, email or mail, our Metal Mining Industry Executives Database allows you to meet the purpose. Being one of the top marketing solutions provider, Blue Mail Media’s highly skilled team of data scientists, marketers and subject matter experts have a fair idea of the marketing challenges faced by wide-ranging industry. Reasoned to the same, we offer to customize our Metal Ore Mining Email Database to fit into your campaign specific requirements.